Tears welled up in the eyes of the Kenyan farmer. He knew no English. From the depths of his being he communicated happiness and pleasure. He could not say ‘thank you’. From the depths of his being he communicated happiness and pleasure. A rare opportunity had been bestowed on his daughter. A rare opportunity had been bestowed on his daughter.The scene was Rongai, Kenya. Such events were unique in this remote village, near the equator. It was a bittersweet moment that had been born of one man’s determination that tragedy would have a happy ending. For their 25th wedding anniversary in 1999, Peter and Chris Dalwoodof Glen Waverley had enjoyed a mighty celebration trip: a safari to Kenya. Here they met Hamish Grant. Tragically, Hamish had recently lost his wife. The Dalwoods were impressed that Hamish was setting up the Vanessa Grant School in her memory. Tragedy stood already in the wings. Chris fainted on the plane home. A losing battle with ovarian cancer had started. Chris had been a well-respected teacher at Avila College, Mount Waverley for some 20 years. Photo: Peter gives the award to Tabitha as her father looks on. This gives his daughter a real chance in life. As International Chair at the Rotary Club of Glen Waverley, Chris secured a Rotary grant for furnishings at the school. 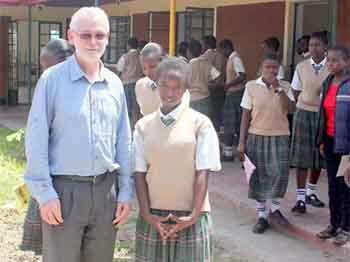 Several Glen Waverley Rotarians went to Kenya to visit the school after it opened. By cruel coincidence this was when Chris passed away. 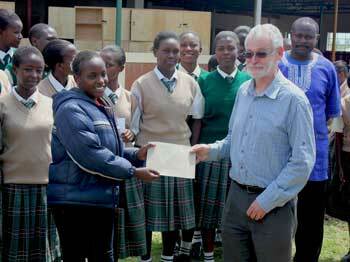 In Kenya few girls receive a secondary education. The Vanessa Grant Girls School offers that chance. Peter decided to develop the theme: The Chris Dalwood Memorial Scholarship would allow girls to go on to tertiary education. Photo: Peter and Tabitha pose for the camera as her friends look on. Peter was able to fund the scholarship and organize its administrationvia the Lord Mayor’s Charitable Foundation. Now one girl per year will have that golden, wonderful opportunity of a career which befits her talents.Criteria are based on academic standards but also the assessed need of the student. 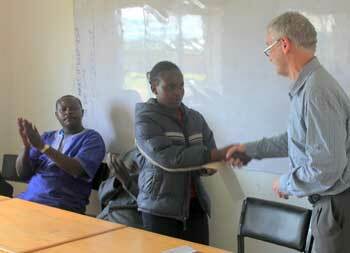 This year Wagaki Mbugua was the recipient.It was fitting that her father would find the whole experience emotional. Peter also sponsors another girl, Tabitha. She made a formal speech of thanks to Peter in front of the school: a moment of extreme emotional intensity. Light, hope and optimism had vanquished tragedy. Sometimes it is not such a bad old world! Photo: Peter poses for one last shot with Tabitha before leaving for Melbourne.